In a press conference held on December 9th, 2014, Service Director Dan Ashe announced the decision by the U.S. 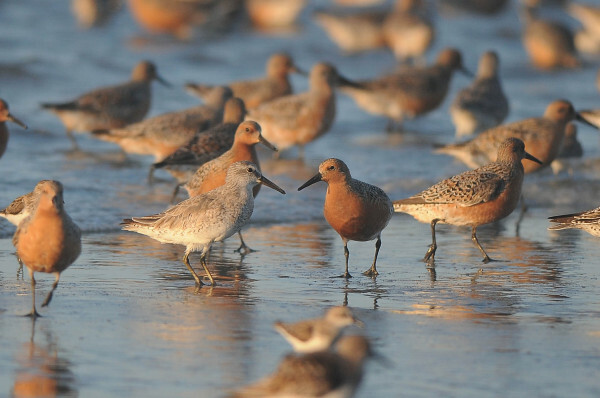 Fish and Wildlife Service to designate the rufa subspecies of the red knot as threatened under the Endangered Species Act. A “threatened” designation recognizes a significant risk of becoming endangered throughout all or a portion of a species’ range. The announcement concludes a multi-year, comprehensive assessment of available information on both the population and potential threats, including coastal development, climate change and declines in horseshoe crab eggs – a key prey resource within Delaware Bay. A flock of knots foraging at a Georgia stopover site. Photo by Cory Gregory. Rufa red knots have one of the longest migrations known to science. From breeding grounds in the high arctic, a portion of the population migrates to winter grounds on the tip of South America, a round-trip distance of over 20,000 miles. 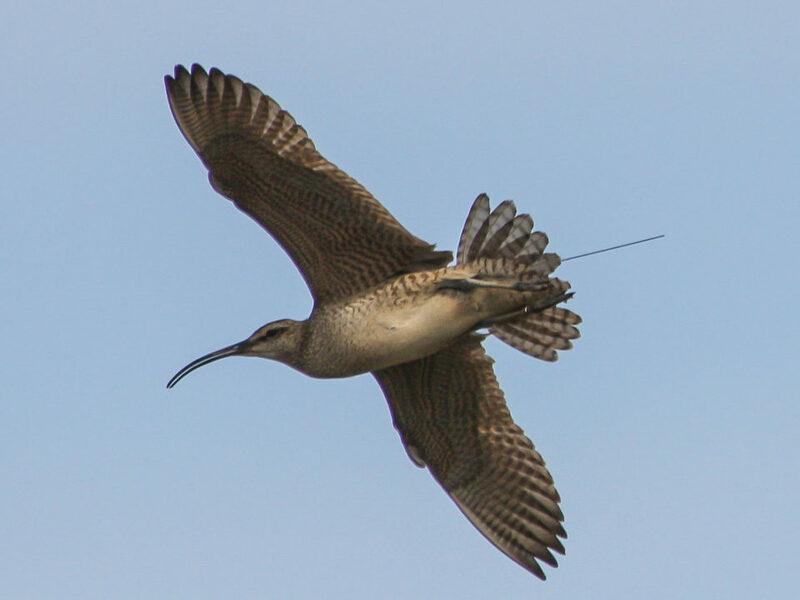 Like many shorebirds, these extreme migrants require concentrated food resources to prepare themselves for long flights. 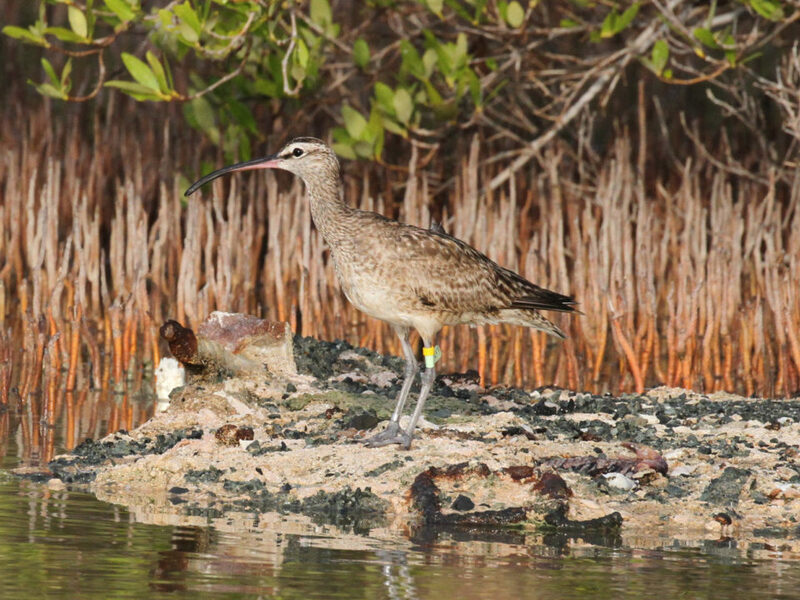 Deterioration of prey resources and foraging conditions within refueling sites is believed to have played an important role in their decline. Since the early 1980s the population has declined by more than 75%. Data collected in Virginia played a significant role in the listing process. 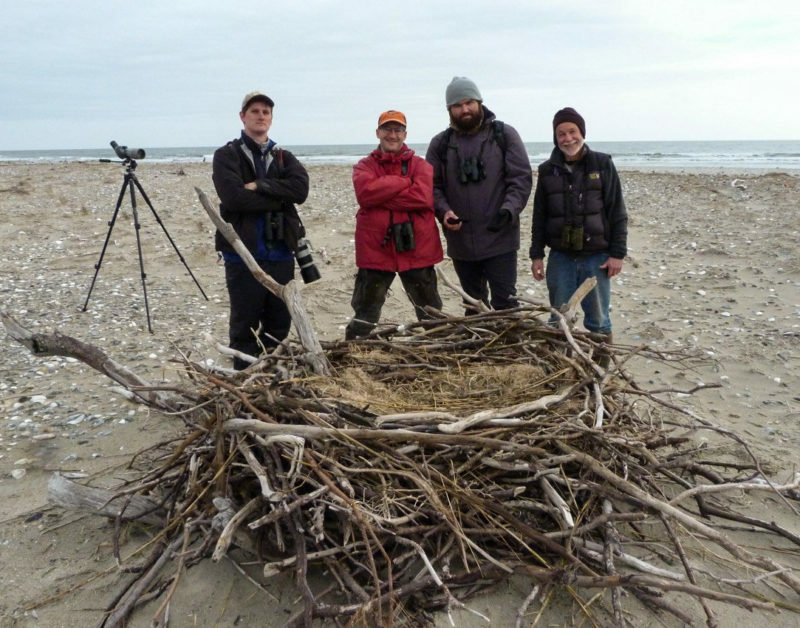 Since 1994, Bryan Watts (Director of The Center for Conservation Biology at the College of William & Mary and Virginia Commonwealth University) and Barry Truitt (Chief Conservation Scientist for the Virginia Coast Reserve of The Nature Conservancy) have conducted weekly aerial surveys of shorebirds along the outer coast of Virginia during the spring migration season. 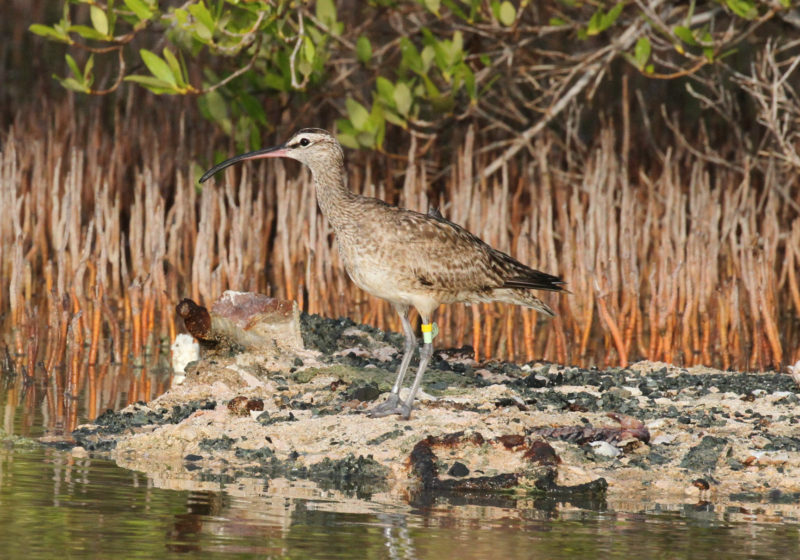 The results of these surveys were provided to the Service and have been used both in listing deliberations and in the ongoing designation of critical habitat for the species. Virginia will play a critical role in the stabilization and recovery of the rufa population. Each spring, the Virginia Barrier Islands provide a refueling site to 30-50% of the entire population. 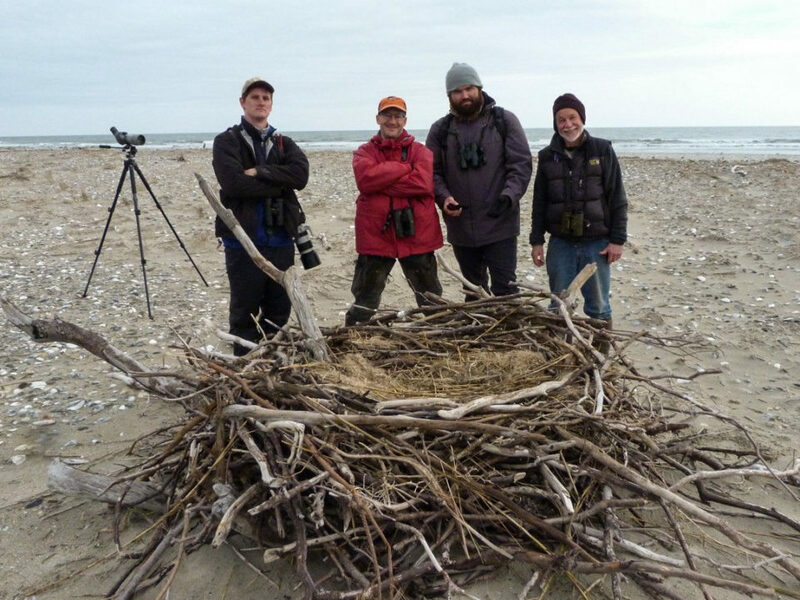 Birds stage here before embarking on their final flight to arctic breeding grounds. Unlike the highly developed coastlines of New Jersey to the north and North Carolina to the south, more than 95% of the Virginia Barrier Islands are in protective ownership by The Nature Conservancy, the U.S. Fish and Wildlife Service and the Commonwealth of Virginia. 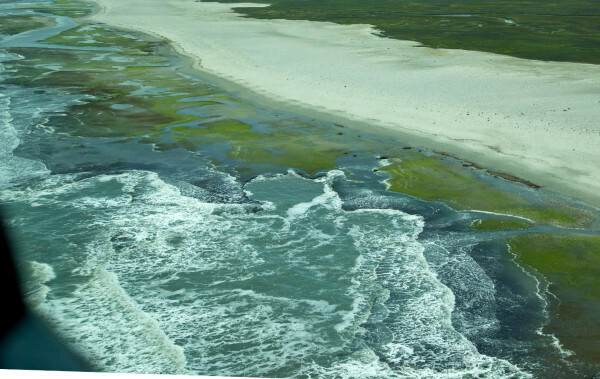 This pristine coastline provides a much-needed oasis for the birds during their northward migration. 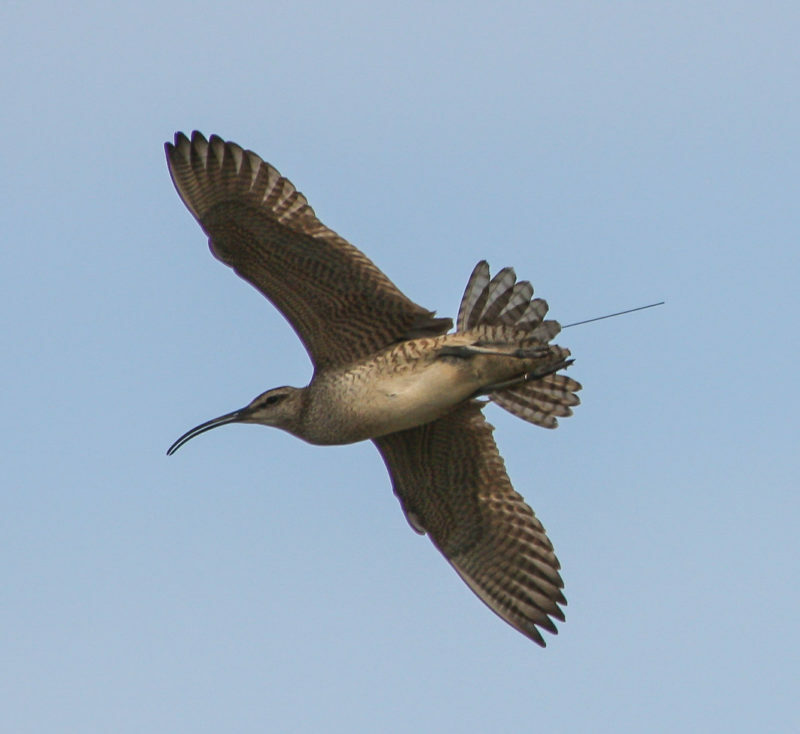 In a forthcoming paper to be published in the Journal of Wildlife Management, Watts and Truitt outline the importance of Virginia to staging knots and sound an urgent alarm. Unlike the well-known staging area in Delaware Bay where knots feed on horseshoe crab eggs, knots staging in Virginia feed on intertidal mollusks. In most years, blue mussels are the food of choice. Spat of the blue mussel on intertidal peat along Cedar Island in Virginia. The developing spat has a characteristic blue tone from the air. In many years this is the primary prey of red knots staging on the Virginia barrier islands. Photo by Bryan Watts. The distribution of blue mussels is undergoing a catastrophic shift due to climate change. Blue mussels are extremely sensitive to warm seas, and over the past 50 years their range has been contracting northward at an average rate of 7.5 kilometers (4.7 miles) per year. Virginia is now within the trailing edge of this range, suggesting that within the relatively near term, knots may no longer have access to this resource. The loss of blue mussels may have a much greater impact on the migration system of the red knot than the well-publicized harvest of horseshoe crabs.